One of my favorite styles of eating is tapas. I love the entire concept. It’s built upon a social nature and encourages trying new things and indulging, even if it’s only for a little taste. You go with the best of company and don’t have to have an “eat until you’re satisfied” mentality. You might start at a tapas restaurant with the intention of sampling two plate, but by the end of the meal, you’ve had tasted half the menu! In case you aren’t familiar with tapas, let me explain. It has Spanish roots and is basically a bunch of small appetizer size portions. And as much as my academic background frowns upon it, here is a good summary about tapas on the hotly debated Wikipedia. Of course, if you want to hear it de la boca del caballo (the horse’s mouth in Espanol) and get a couple tapas recipes, Tapas Recipes gives a great view on the meal itself. I had to pull myself away from the recipes! They all look so good! But, I digress. Sometimes, I think that life can and should be like a tapas menu. Living life like tapas is exceptionally appealing to me. You live in the moment and enjoy it, even if it is only for that moment. The future is out there, but why worry? You are savoring the experience! After taking a bite, you truly live there and taste that bite. Now, with a tapas restaurant, always comes a risk. Due to its social nature, you might not be the one ordering a plate. Thus comes your dilemma. Do you eat it or do you abstain? If you full well know you don’t like it, you can always say no. Past experience has trained you. You do not like XYZ. Of course, with that decision comes the risk of missing out. Our taste buds (and general tastes) change over time. Last time you ate tomatoes, you didn’t like them, but today, you might like them. Preparation might be different than what you’ve had the in the past. Do you pass up an opportunity to experience your new favorite dish? Or do you stick with your tried-and-true, experience-tested, tastes? This is a choice everyone must make (though personally, I try to live my life in a place of yes and at least give it a shot). Yes, you might take a bite that is less than savory. In fact, it might be pretty awful. You thought you liked feta cheese, but there’s something just not right with the cheese dish on the table. Lucky for you, you are eating tapas! This dish isn’t your entire meal and doesn’t have to define your meal experience. Call your server over, order a new dish, and voila! Goodbye unappetizing feta, and hello bacon wrapped scallops! The same idea applies to life. We have all been served some less than ideal dishes through life. Whether it is bad luck, divorce, losing a job, or even just a rainy day, that isn’t all that there is. The best thing to do, is take a sip of your wine (to cleanse your palette, of course!) and look for that next dish to enjoy. Sometimes you make the choice of the next dish, other times others choose for you. Regardless, that plate is coming! Ready or not, you’re next chapter is coming for you. So, what can you do? Strap in, grab your fork, and get ready to indulge in your next adventure. PS- For those of you who live in Indianapolis or ever find yourself in this midwestern city, I must recommend BARcelona Tapas. Incredible food, great atmosphere, and fantastic sangria. 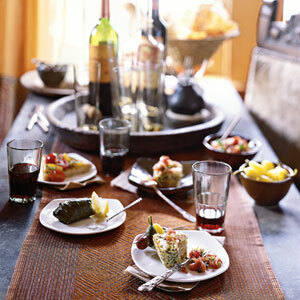 Also in the spirit of tapas, share with me your favorite tapas recipes! Who says you have to go out to enjoy good tapas?